From the author: Most of us will experience death at some time. When that happens, I know that you will feel… devastated, mentally drained and desolate. Whether there are emotional, mental or financial scars, the damage is apparent and when there is a death in the family, everyone suffers. Where can you turn to for help? There are so many sources of assistance but which is the one that will give you immediate consolation and a definitive guide for help with life before and after a death. 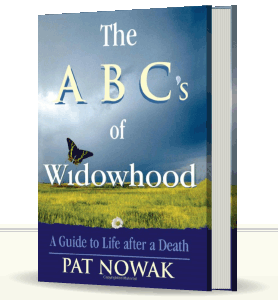 I think it is my book, The ABC’s of Widowhood. My book was written for women, men and the newly divorced. It is a dictionary for living but more importantly, it gives you practical advice and a powerful resource in an easy to read format that can be used the rest of your life. You need to have encouragement as you face the adversity alone. My book will empower and challenge you to embrace the ABC’s for living, Attitude, Balance and Courage. The step by step healing process will help you close one sad chapter in your life and offers you a support system for the ultimate transition to your new life… it is an invaluable guide for the living. Please know that you do not have to go through the heartbreak alone. The ABC’s of Widowhood will help you on your journey to a new spiritual awakening. As you grow, peace and serenity will enter your life and you will discover what a resilient and courageous person you have become. Please enjoy the book. I hope that your new life is everything you wish for and remember death need not be the end of your life. You have so much more to give, learn and enjoy!